Brad Wehking, Alice Salli, Matt Hoffman, Cindy Peters, Doug Justman, Brenda Gatzke, Loree Walker, Mark Dutcher, Daniel Devers, Katrina Salli, Rob Wolter, Beth Brodske, Terri Breese, Gregg Breese, Teresa Justman, Sue Brady, and in the back row Bryan Gatzke is holding up Lynn Walker. Not pictured: Pete Berres, Chris Gruchow, John Krueger, Ryan Nowatka, Mike Rollert and Jane Brotski. 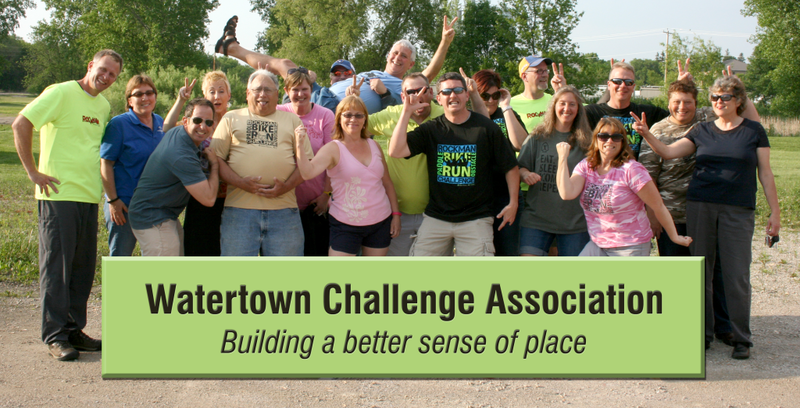 The mission of Watertown Challenge Association is to protect and enhance the quality of life and build a sense of community pride by sponsoring actions which help our members, residents, environment and businesses. The organization shall provide opportunities for members and guests to join together as a community, within our greater community, to maximize self-determination by social and organizational means. In its activities, the Association will maintain a careful respect for the rights and prerogatives of the members and appreciation for individual differences. It is a 501C3 non-profit organization which means we are not about making money and we are prohibited from any political participation/support. Get your politics somewhere else. It is a social group that meets frequently throughout the year. We have fun! We talk about and brainstorm projects that we want to bring to Watertown. Our efforts go towards creating events that are FUN for us and the community. The purpose of this group is to help clarify our vision and find success. In the beginning, the size of the group needed to remain very small so we could maintain our focus and not dilute what we are trying to accomplish. Raising funds for charity is not our number one concern, first and foremost we want to create, execute and sustain unique & FUN cultural programs and sport events for the community. In 2008, Pete Berres and Gregg Breese spent a remarkable weekend away from home. We both have strong opinions and we found an area of absolute agreement. After you read this we hope you see the same fundamental principle that became so obvious to us. Watertown is a good place to live, but it could be great place to live. We have had numerous discussions on the culture of Watertown. We asked ourselves what is Watertown missing? From these discussions we formed a vision of what Watertown could be and decided to create the Watertown Challenge Association. We are both involved with various civic/social groups and church committees in Watertown. We have shared our likes and dislikes about these groups and committees and decided that the Watertown Challenge Association would be run quite a bit differently. We set out to have a positive impact on the culture of Watertown. The organization to accomplish this is the Watertown Challenge Association (WCA). Our purpose is simple and challenging. There is no “end game” or time where we will say “now it is done.” Rather we will seek to always make things better. The cause here is our lives and families and making them better. The method we are choosing is to gather good people and create positive experiences and opportunities for others to play along. Well, there is much more to say however it is better done in person. So what are the basic commitments? Getting together on a fairly regular basis to enjoy each other’s company and talk about things we want to do. No hidden agendas, no mandates to do any particular thing, simply a time to socialize. We believe it is critical that when we get together the results of us simply talking and thinking will guide the future. We also believe it is equally as critical that we all have fun and avoid stuffy traditional volunteering junk. Remember, it is all about all of our life interests. So there you have it, pretty simple yet very difficult to explain. If you are interested, and we hope you are, we would like to hear from you.